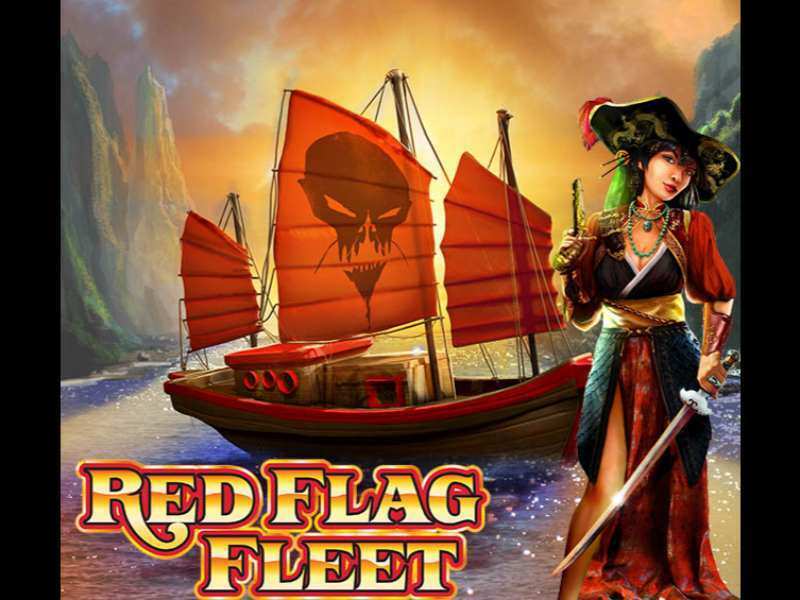 Red Flag Fleet is a popular pirate themed game, developed by one of the famous names in the online slot machine game world, WMS. The slot consists of a pirate invasion theme and the entire visual arrangements, right from the graphics to the sound part, Red Flag Fleet has stood up to put an intense competition versus many other similar online slot machine games. The game can be played online and requires no download or registration and can be played across all those casinos which support games from WMS gaming and in countries like USA and UK. Some casinos allow the players to play free Red Flag Fleet casino slot machine and enjoy to the fullest. The game contains 6 reels and 192 winning paylines. Backing all these, is the higher variance and RTP, which is analyzed to be as 96.04%, and ensures this to be a very good game for real money gamers. The minimum bet line is .40 and the maximum is 80. Moreover, the game does not give out any sorts of progressive wins or bonuses. For starting the proceedings, players need to press the spin button and wait for the fortune to strike real good. However, it is obligatory from the players’ part to fill in coin values and wager details before they start the game. The combination will see winnings which will appear on 192 active payout lines. The payouts and winnings are flashed at the pay tables and are sorted according to the bet configurations. The payout process in the form of line pay occurs on the adjoining reels, and starts from the leftmost reels and only the maximum wins are remunerated. Out of the 6 reels in the slot machine game, the leftmost has 2 rows and the rightmost has 7 rows of symbols. The winning payout lines are fixed and cannot be manipulated. However, the players have a chance of selecting the total bet multiplier and the total bet and decide on how much to bet or not. Like any other slot machine game, more the bet made, more are the winning chances. Wild Symbols: The Wild symbols in the game stands up and works as a replacement or substitute to any other symbols except for the scatters. Scatter Symbols: Scatter symbols are perhaps the most useful in the game and are more frequently spotted. The boat symbols with red sails are the scatter symbols and the feature awards free spin features. During the time of reels flipping around, there are about seven positions on the 1st reel and counts down from 1 to 6. Aside this, there is at least 2 dedicated wild reels, which will later be added to set on every individual spin. This will make scoring free spins a lot easier than ever. On hitting three or more pirate ships (scatters) on the reels 1 to 5 will result more number of spins. Red Flag Fleet slot is a classic pirate themed onlinecasino slot machine game to be developed by one of the renowned names of the slot machine gaming world, WMS. The game follows up with the theme and gives rather a strange slot for the gamblers to play for.The reel structures simply add to the flavor and possess a very healthy variance and RTP ever given by a slot machine game. The game has the theme of Chinese pirates and the invasion theme makes this slot machine game even more interesting than ever. The game also sports free spin rounds, which helps in adding up the total wagers and these are backed up by ample help from Wild symbols as well. Thus in short, Red Flag Fleet is a must play game for every themed slot machine game lover. 0 responses to "Red Flag Fleet Slot"